The farmers of Himachal Pradesh have to fight with several natural conditions to grow crops. One of the biggest issues is lack of adequate rainfall during the peak agricultural season. Artificial irrigation is the only way to meet the water requirements in the farms. But small and marginal farmers don’t have enough money to purchase irrigation water pumps, which are power by electricity. 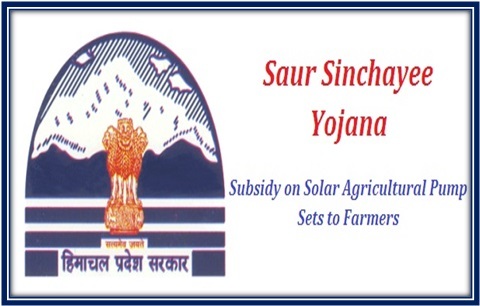 Thus, the state government has come to their rescue with the launch of Saur Sinchayee Yojana. This scheme offers financial assistance to farmers so that they can purchase irrigational pumps, which are powered by solar panels. Development of agriculture – Himachal Pradesh government also desires to double the earnings of common farmers by 2022. The solar powered irrigation pumps will help poor farmers in attaining more produce, without worrying about water. Financial subsidy for farmers – Under this agricultural development project, selected farmers will be able to receive financial subsidy from the state government. Small and marginal agricultural workers will attain 90% subsidy, while medium or big farmers will receive 80% subsidy. Subsidy for agricultural groups – Several small or marginal agricultural workers can attain 100% subsidy if they apply for the pump as a group. The same benefit will be offered to agricultural workers who are associated with Kisan Vikas Sanghs or farmer organizations. Total number of pumps to be distributed – The state government has highlighted that it will distribute as many as 5850 solar powered irrigation pumps. Total number of farmers to be benefited – This project will directly benefit as many as 9,580 agricultural workers, residing in the state. Total land brought under irrigation – With the implementation of this project, Himachal Pradesh government will be able to bring as much as 7152.30 hectares of cultivable land under artificial irrigation. It will increase the agricultural output and income of the farmers as well. Residential requirement – The unique scheme will be funded and implemented by Himachal Pradesh government. So, only farmers who are legal residents of this area and have residential details will be able to apply. Occupational requirement – As the scheme is only for those farmers who are associated with agriculture as their main source of income will be allowed to apply. Such certificates must be furnished by the applicant. Identification of farmers – All applicants will have to offer their personal identification details for scrutiny. Thus, submitting the voter card and Aadhar card are a must. For all categories of farmers – Previously, stress was put on the development of small and marginal farmers alone. With this scheme, that will change as apart from poor small and marginal agricultural workers, big farmers will also attain solar pumps at subsidized rates. Thus, all farm land and sowing related documents must be submitted. Himachal Pradesh state has just announced the scheme officially. Nothing has been finalized about the registration process. We will offer these details to our readers as soon as the state authority comes out with an official declaration. The state government has already assigned a lump sum for the acquisition and distribution of solar pumps. If the first phase offers satisfactory results, then it can allocate more funds towards implementation of this project extensively. Without agricultural development, it will be rather challenging to improve the position of local farmers.